Briskair have successfully distributed the Viesa Evaporative Cooler range of Products for over 13 years. We believe these products have been successful because of their simplicity. Viesa Have a product to suit every application & Budget, from the Platinum Series Roof Mounted to the Internal 2 Rear wall mounted system. 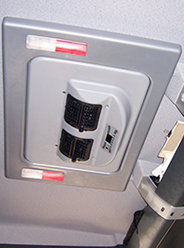 Both systems are remote controlled with a full LCD display panel for operator control. Choose our Viesa Evaporative cooler range, if you don’t sleep in your truck every night of the week, if you are a fleet operator, budget conscious or may not be comfortable with 134A Refrigerant cooling systems. The systems are 12 or 24v & designed to run from the vehicle’s crank batteries for up to 10 hours subject to vehicle battery life, with a built in Battery, low voltage sensor/shutoff. 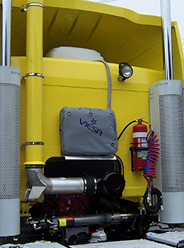 Viesa coolers continue to distribute with high volume sales around Australia, we consider them an entry level cooling system in today’s competitive sleeper Cab cooling market. The Viesa Platinum is the most comfortable way of traveling and resting in your truck. The release of the new Viesa Internal II model of truck cab air conditioning systems combines maximum performance with a new compact design.